(Mosquito flower; Perilla) Mexican herb used for stomach ache, diarrhea, skin rashes, and infections of the kidney and urinary tract. Research shows that this herb kills pathogenic bacteria, including at least one drug-resistant strain. It is effective against yeast infections caused by candida and kills the parasite that causes leishmaniasis or "black fever." It is also an anti-inflammatory, almost as effective as modern steroid drugs. 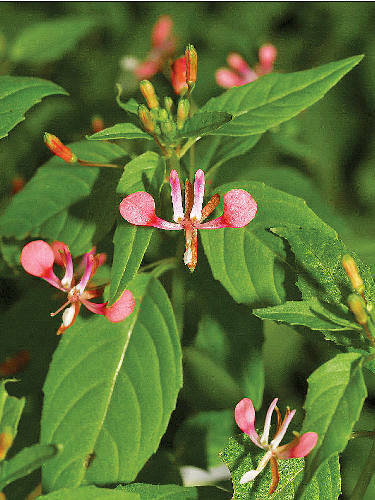 To gardeners, this attractive plant is known as "mosquito flower" because its pink flowers vaguely resemble the little pests. It is also known as "pink brush" for its masses of pink flowers throughout much of the summer and fall. Ht. 40-60cm/16-24".